I love stews, one-pot meals and generally heavier dishes, so I find it difficult to come up with summer meals. However, I had the idea of making a quiche for my husband and I. My eldest has ALWAYS claimed she detests quiche (she had it at nursery), so I made one just for us. However, it turned out that everyone liked it. This following is an adaptation of a recipe from the Silver Spoon Cookbook. It incorporates the lower fat crème fraîche as well as the pastry of the Jus-Rol quiche Lorraine recipe. It is really easy to make and doesn’t require a tonne of ingredients. The quiche can be eaten hot or cold. In the past I’ve served with pea shoots, rocket, coleslaw or green beans. The girls accompanied theirs with squash. 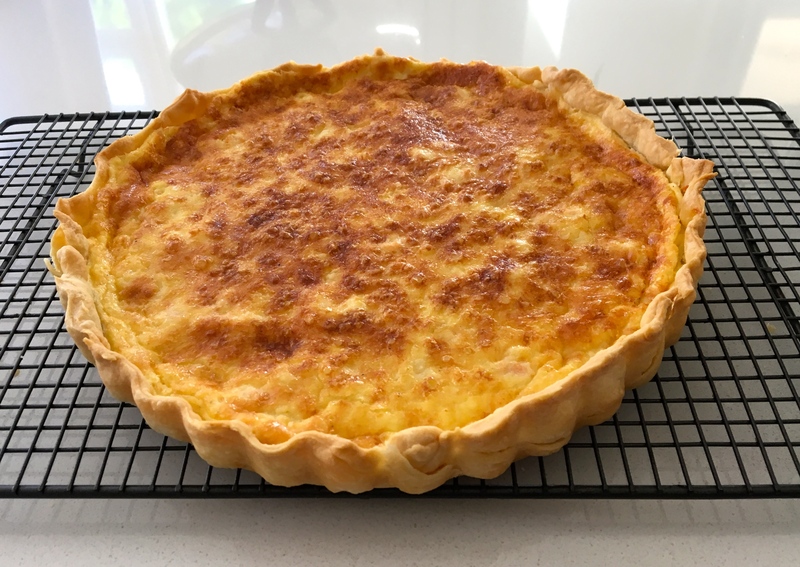 We accompanied with a glass or two of Trebbiano D’Abruzzo but here are some more ideas for what to drink with it: 3 Wines to Pair with quiche.